DJ Capitol K aka The Innovator stated that “I am not an IPod”. “I am an INNOVATOR” I am a true master of my craft. I have always been a trendsetter with my style of turntablism. The way I blend songs, remix, plus cut & scratch is like a magician. “I came up in the era when a DJ had to have hand skills. I am cut from a different cloth”. With a pure ear for good music I am constantly spinning the classics and exclusives to set the mood for any occasion. His family influenced him by as he describes it “The Soundtrack of Our Life”. Meaning their smiles, cries and the experiences they shared together. He fell in love with music at a young age and wanted to learn how to manipulate it like the pioneers before him. It was the love of music and Hip Hop culture that motivated him to become a DJ (which is different from just playing records). In “86” when he became serious about DJing, Rap/Hip-Hop/Turntablism was not that big or even celebrated locally at that time. There were very few DJ’s around and even more few who were respected. It was a small community and cult following who really understood it, and that is where Capitol K’s commitment and passion comes in therefore he respected the art of DJ’ing. At the age of 16 is when he would first start at local events such as cook outs, family reunions, receptions, house parties etc. Thankful to that handful of people and peers that he linked through the years is what kept him motivated through his process and pursuit. DJ Capitol K learned to maneuver through the Underground Hip Hop/DJ Scene in the D.M.V (DC, Maryland, Virginia) since the late 80’s. He would DJ at every event he could get his hands on. He did everything from parties, showcases, talent shows, clubs, cabarets even working with recording artists and music production. DJ Capitol K was also a part of a three man rap group that got signed to one of the biggest local labels in Washington DC at the age of 17 while still in high school. Straight out of high school he decided to study music management and production at the Art Institute of Atlanta. Since then he has navigated his own course, building his own brand, celebrating his music and style of DJ’ing and for that reason he is forever thankful for the motivation of DC! DJ Capitol K has been a featured DJ at various hot spots in the D.C. and Atlanta area through the years (Jaguars, The Atrium, The Shark Bar, The Aquarium, The Red Lounge, Cloud IX Rest. & Lounge, Club Aquarius, The Warehouse, The Argonaut Tavern and Official DJ at LARGE FM. He has also provided music and entertainment for several Internet Radio Shows, podcast, private parties, cooperate events and weddings. He truly loves his craft and has a well proven track record of prompt, professional service. His overall goal is to continue building his Brand and style of DJing. There are infinite possibilities that he would like to take his DJing career. As far as the Entertainment Industry there are the club events, concerts, festivals, radio, music production, tours, television and movies that he is looking forward to pursue. He does not claim to be the best but his style is “Pure” and “Creative”. It’s all about the music because he will play what you want to hear (Classics) and he will also play what you need to hear (Breaking New Music). He loves to spin for a crowd that leaves their ego at the door and celebrates life through music; “stimulated” is what he wants his audience to feel while listening to him spin. Currently DJ Capitol K is a featured DJ on Vyzion Radio as part of an elite collection of Djs from across the globe. 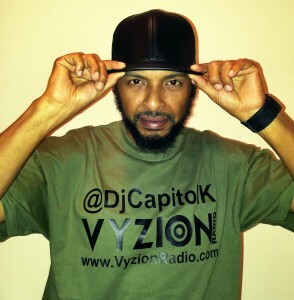 Currently Dj Capitol K is a Resident DJ Monday – Friday 9pm – Midnight on Vyzion Radio and can be heard Worldwide.